Border guards in Bangladesh refuse entry to Rohingya refugees from Myanmar in November 2012. Credit: Anurup Titu/IPS. SINGAPORE, Feb 20 2014 (IPS) - Two Myanmar Buddhist politicians who were visiting Malaysia narrowly escaped a late night assassination attempt outside a leading shopping mall in Kuala Lumpur this month. The incident has raised fears of an overseas spillover of the religious violence that has engulfed their state of Rakhine in recent years. Aye Maung and Aye Thar Aung are leaders of the Arakan National Party (ANP), representing the mostly Buddhist Rakhines, the largest ethnic group in Myanmar’s western state of Rakhine, which was known as Arakan during British colonial times. Gunmen riding a motorcycle fired a number of shots at a car carrying them and their companions in a busy shopping area of the Malaysian capital, but no one was injured, according to eyewitness reports. Some Muslim groups in Malaysia, however, claim that the ANP has staged the drama in order to gain the sympathy of Buddhists in Myanmar ahead of the general election there in 2015. Rakhine state has witnessed several episodes of violence since 2012 between Buddhists and Rohingya Muslims, leaving scores dead and displaced. Many of the victims were from the Rohingya Muslim minority, considered by most Myanmar Buddhists as illegal migrants from Bangladesh. Thousands of Rohingyas have fled to Muslim-majority Malaysia, where about 250,000 Myanmar nationals – both Buddhists and Muslims – are believed to reside, with many employed in low-paying jobs at restaurants and construction sites. The Malaysian police have been quick to blame Myanmar migrants for the shooting incident. 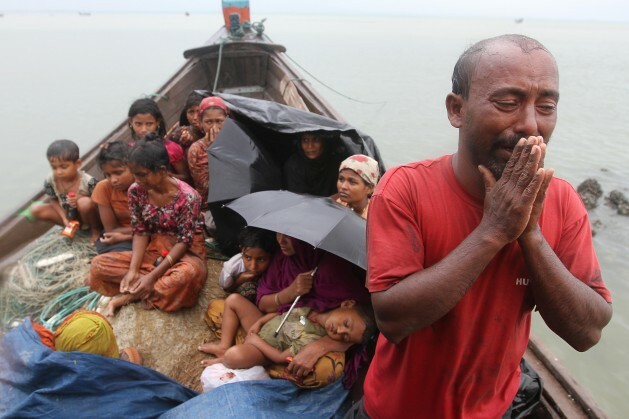 But Malaysian political analyst Dr Chandra Muzaffar, head of the International Movement for a Just World (JUST), said a lot of Muslims in the region have been unhappy with the way Rohingyas are being treated inside Myanmar. He also said they are investigating whether the killing of a Myanmar national, Ko Aung Gyi, in the city a day later has any connection with the shooting incident. Ko Aung Gyi, a member of the 88 Generation Students group who hailed from Rakhine, was killed soon after his meeting with the Rakhine delegation. The former student leader turned political activist from Rakhine had been living in Malaysia with his family for several years. According to his wife, Ma Su Su Myint, he was killed after being called to discuss a business matter. There have been a number of killings within the Myanmar migrant community in Malaysia in the past year. In late May 2013, violence in the community in Kuala Lumpur left at least two people dead, and was widely linked to the Rakhine state’s troubles. Earlier that month, Indonesian police arrested four men who were later found guilty of attempting to bomb the Myanmar embassy in Jakarta. The bomb plot’s mastermind said the conspirators were trying to avenge the killings of their Muslim brethren in Myanmar. JUST has been concerned about the escalating tension between Muslims and Buddhists in the region and in November organised an inter-faith dialogue in Kuala Lumpur attended by Buddhists from across Asia and Muslims from Malaysia and Indonesia. “We have set up a committee of inquiry with Buddhists, Muslims and persons of no religious affiliation to look at the issue and determine what is really happening and provide some solutions,” Muzaffar told IPS. The six-member delegation of ANP leaders that was visiting Malaysia when the attack took place was basically the core political leadership of Buddhists in the Rakhine state. They were in Malaysia to meet exiled Myanmar Buddhists, collect donations and drum up support for their campaigns. They were also believed to have held a town hall-style public talk and discussion titled “Reform in Burma and Arakan Politics” in Kuala Lumpur, according to a blog by Myanmar exile Hla Oo, who says Aye Maung is “bitterly hated” by Rohingya Muslims. Aye Maung’s Rakhine Nationalities Development Party (RNDP) and the Arakan League for Democracy (ALD) – originally two rival groups – formally agreed to merge and form ANP (Arakan National Party) in October 2013, thus making it a formidable force in the state ahead of the 2015 general elections. RNDP’s former stronghold was northern Rakhine while ALD’s bases were in southern Rakhine. ALD won 11 out of 26 seats in Rakhine in the 1990 general elections. ALD didn’t participate in the 2010 elections but RNDP participated and won 16 seats in Rakhine. The ANP leadership applied for official registration to Myanmar’s Union Election Commission on Oct. 15 last year, but their application was only granted on Jan. 13 this year. Muzaffar believes that the Myanmar government is not doing enough to stop the violence in the state and the military may be trying to use Buddhist nationalism to perpetuate military rule beyond the 2015 elections. Referring to the Association of South East Asian Nations grouping of which Myanmar is a member, he said, “Other ASEAN governments can’t do anything to stop this, but they can get a dialogue going under the ASEAN charter of 2007. The attack on the Buddhist monks in Malaysia will ricochet. The Buddhists in Myanmar will blame the Bangladeshi Muslims in Myanmar that they are getting outside support and this attack in Malaysia will be used to punish the Muslims in Myanmar. Who ever is responsible for the attack on the Myanmar Buddhist monks just gave fodder to the Myanmar Buddhists for a “righteous” retaliation.